The plan got materialised recently and as a result, Anukampada Gode came into existence this week, Trupti said. 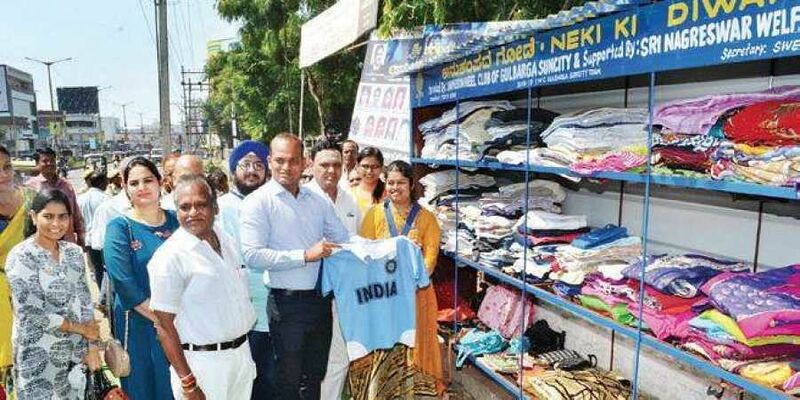 KALABURAGI: Inner Wheel of Rotary Club in Kalaburagi district in Karnataka has introduced a novel concept of Anukampada Gode (compassionate wall) where rich and middle-class families can bring in articles and materials that they no longer find useful and want to discard. Such things can be utilised by the poor and lower-middle-class families. If anyone finds the articles useful, they can take them from this ‘compassionate wall’. Nagareshwara Welfare Society president Raghavendra Mailapur and secretary Ravindra Mukka helped Inner Wheel of Rotary Club realise the dream of helping the poor in the form of establishing ‘compassionate wall’ by constructing racks in the wall of Nagareshwara School situated in Nehru Gunj area of Kalaburagi. The plan got materialised recently and as a result, Anukampada Gode came into existence this week, Trupti said. Kalaburagi superintendent of police Shashikumar inaugurated the initiative. Under this concept, if people find in their homes unused items such as clothes, vessels, toys and cycles as they are outdated, they can hand over those items here. Those families can bring such outdated or unused materials to this place and keep them in the rack. Poor people can come to this place and choose the materials that they find are useful for them. Inner Wheel Club members will provide the materials free of cost to the needy. Trupti and club representative Priti Cauvery said the ‘compassionate wall’ has received a tremendous response as both givers and receivers were thronging the place from last Sunday. As the experiment is getting good response, it will continue for the whole year, they said.